Article from the Grantham Journal, 20th August 1948, reporting on the death of Christopher Gale. Brother of Charles and Cyril Gale. All three served during WW1. Cyril tragically lost his life, but Charles and Christopher survived. Christopher Gale was born in Muston on the 5th November 1896, and entered Muston village school for the first time on the 1st January 1900. He was the second son of Charles C.A. and Isabella (Isabel) Gale. His father, Charles Cecil Augustine Gale, was baptised on the 8th of October 1871 in Muston, son of Christopher and Jane Gale. In 1893, he married Isabel Pritchett, aged 17, in the Bingham district. In 1901, Charles, Isabella and their three sons lived on Grantham Road, Muston, perhaps at the farmstead called Downfields. Their children were Charles C (Cecil) (b.1895), Christopher (b.1896) and Cyril (b.1899). In 1911, the family were living at Downfields, Muston. a farm located at the end of Skerry Lane. Charles Gale senior, now aged 39, was working as a horseman on the farm, while his oldest son, Charles, now 17, was employed as a waggoner at a farm in Normanton. Christopher was aged 14 and employed to do general farm work, while Cyril was still at school. A search of the online newspaper archive gave only one mention of Christopher Gale during the war years. On the 29th April, 1916, the Grantham Journal reported that both he and his brother Cyril were in attendance on their elder brother Charles at his wedding in Leeming St Methodist Chapel, Mansfield. Charles’ bride was Mary Lee, from Pleasley, near Bolsover, Derbyshire. Among the WW1 Medal Index Cards found for soldiers named Christopher Gale, three have been selected as being potentially his, though have been shown with certainty to describe the soldier from Muston. Perhaps the most probable candidate from these is Gunner 149420 Royal Field Artillery. Information from Forces War Records adds that this soldier was part of B Battery, 64th Brigade, and was wounded in November 1918, when he was 21, with an incised facial wound. 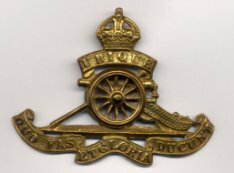 The second ‘possible’ identified from the MIC records and Forces War Records information is Private SS/18738, Royal Army Service Corps, but no further details for this soldier can be added at present. Less likely is Private 27108, 18th Royal Welsh Fusiliers; in this case, Forces War Records information states “particulars furnished at Shrewsbury”, which seems to imply that this is where he came from. Christopher Gale married Mary A Coupe in 1921, at Mansfield. This is confirmed by the entry in the 1939 Register, which reveals that 579 Chesterfield Road North, Mansfield, was the home of Christopher Gale, a coal hewer, born 5th November 1896, who must be the man who grew up in Muston. With him were his wife, Mary Gale, born on the 23rd July 1899; their son Alan Gale, unemployed, born 19th August 1925; and Mary’s incapacitated widowed mother Jane A Coupe, born on the 15th October 1865. Evidently, after discharged from the army Christopher Gale found work in the coal mines at Mansfield, and stayed there for the remainder of his life. Both he and his older brother Charles became mine workers in Mansfield. They may even have worked at the same mine. They both married women from the mining village of Pleasley, near Bolsover. Christopher Gale died in 1948 at Mansfield, aged 51. His passing was reported by the Grantham Journal on 20th August, 1948.